Cupid Loses Arrow Graphic. Click the image to view and download the full-size version. A Victorian or Edwardian cupid in gorgeous pastel colors. The pink shades really pop and yet the whole image is so pleasantly soft. The cupid apparently lost his arrow in the water and is trying to retrieve it. I only just acquired this image. I knew I had to buy it and share it with you the first time I saw it as it would not only be great for Valentine’s Day projects but also for numerous projects and crafts all through the year. This is such a wonderful image that I decided to make a seamless tile from it. So if you like this image don’t miss the tile as it would be great for flood filling a background paper or for a photoshop pattern. 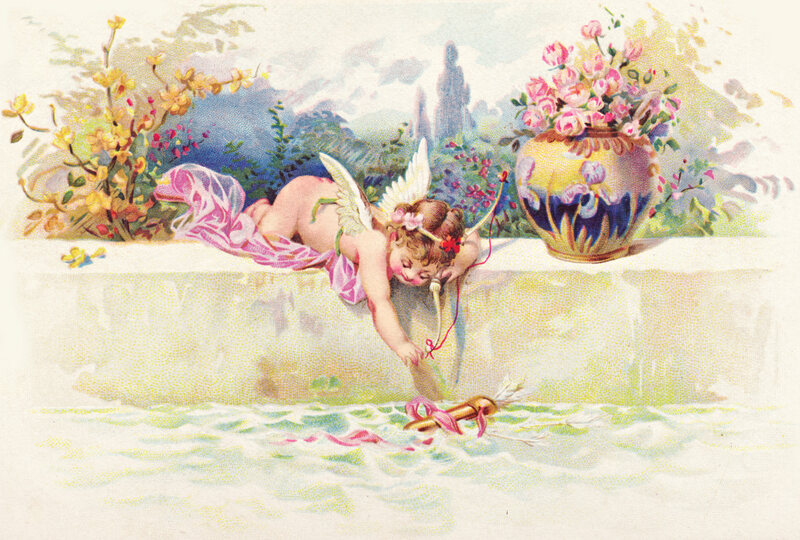 This entry was posted in Valentine's Day and tagged antique image, Cupid Loses Arrow Graphic, free graphics, Valentine's Day Clipart, vintage image on November 12, 2014 by ClipArtPlace.